Show your Valentine just how much you love them by really speaking from the heart with these cute home décor ideas! Not only are they cheap and easy but they take no time at all! Cut out hearts from different colored papers and write classic ‘love heart’ sweet phrases on them such as; kiss me, be mine, first love, etc. Then string them up! All you need is string, paper, scissors and a pen! Head to the beach (or just outside if you don’t live by the sea) and search for some beautiful stones to paint hearts onto. These can be placed in the home or the garden to remind your Valentine that you love them. Go the extra mile and write cute messages on the other side of why you love them. Fill the celling with red, helium filled balloons! Attach messages, photos, drawings, or even sweets to the bottom of each so that it’s a sky full of love for your Valentine when they wake up on Valentine’s day morning. If you are more of a traditional romantic, go for the classic rose petal trail. Leave a trail of petals to wherever you want to lead your Valentine (like a romantic dinner!). A very simple, yet effective, paper chain can be made by cutting thin strips of paper, folding them in half and then turning the 2 opposing ends into each other and stapling them together. These can then be attached to form a heart chain that can be draped over a picture, door way, bed frame etc. Spread the love by creating a heart made of sticky notes on your loved one’s mirror or door. Fill the notes with cute messages of all the things you love about them, or all the things you want to do for them. Spend the next couple of weeks before Valentine’s day collecting glass jars which you can paint or write messages on. Glass paints can be bought really cheap from craft shops. Then put candles inside and begin to set that ambience for the night. You will need to head to the garden for this one and collect a handful of small thin branches. Arrange these in a vase and cut out small hearts (or get them from craft shops) and tie them to the branches. Buy some champagne flutes and fill them with whatever objects of love you can find and line them up along the mantel piece. They can be stuffed with pink and red smarties, fabric hearts, small gifts. Whatever you feel shows your love. 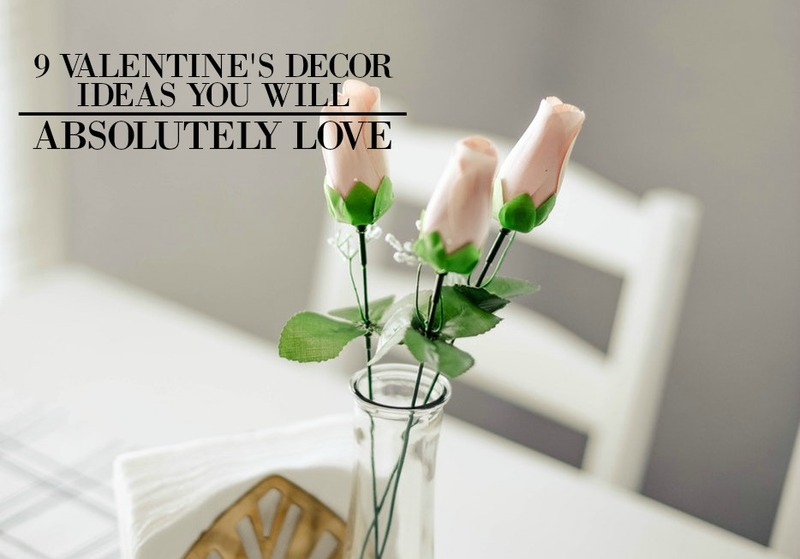 So get cutting and sticking and show your loved ones exactly how much you love them with either one or all of these Valentine home décor ideas!